A blog about Microscopy and related topics . . . This is a brand new blog, by a brand new blogger. However, some readers may recognize this blog's title, taken from a series of books of the same name. Unfortunately, time has a way of gradually making printed material all too quickly outdated -- especially these days -- and so, this blog was created partly as an attempt to address that issue. 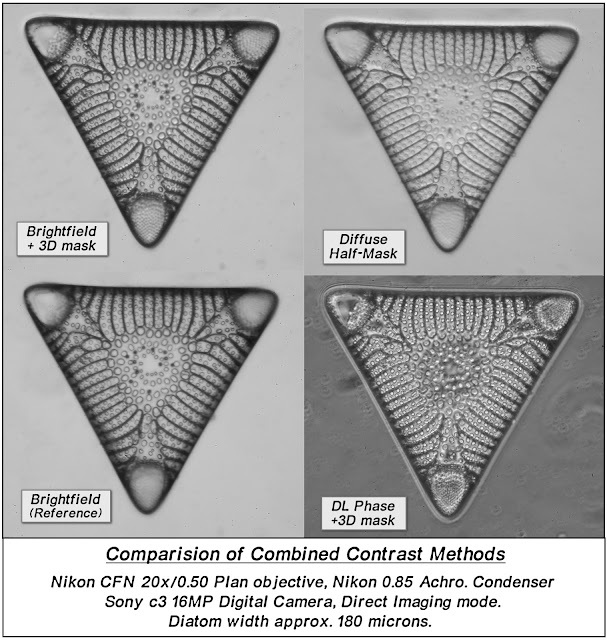 As we move forward from here on-going efforts will be made to transfer selected content from the Better Microscopy books series into this new format, not only to provide to provide more effective distribution, but also as a means for making timely additions and overdue updates to that material. In addition, much previously unpublished material is now planned to be released, including high-resolution color images. The current plan is to aim for a content mix that is both interesting and educational -- perhaps even inspiring -- and which will address the needs and interests of a wide range of user levels, from beginner to semi-professional. With more decades of Microscopy experience than I care to admit, I hope I will be able to contribute something to others in terms of both knowledge and enjoyment. I hope you find something of interest in new undertaking as it takes shape and gain much from its content, now and well into the future! Apologies are extended to any and all who may have been inconvenienced by the recent loss of access to this Blog, which has now (hopefully...) been restored to its previous state. Unfortunately, recent events make the continuation of this Blog appear uncertain, due to an ongoing need to dedicate very limited resources to much more urgent tasks. Users are therefore urged to download any Blog content (e.g: .pdf's) of interest to them while this material remains available. Note that should content from this Blog be transferred to another site, a link to that site will be placed here and maintained for as long a possible. Thank You for your continuing interest and support. . . Secrets of the Leitz Heine — Part 3. The saga of Leitz Heine "Secrets..." continues with this latest release – Part 3. Leitz ceased production of their Heine condensers in the 1970's and no new version was ever made for the new scopes. So, if you have (or want) one of these scopes, and wish to mount a Heine on it, the methods in this Part may be your best bet! Note that this Part continues the shift towards increased use of graphic illustrations, instead of lengthy descriptions. Secrets of the Leitz Heine — Part 3 (.pdf). Parts 1 and 2 of this series were released in an earlier post (October 22, 2018). I hope you find this latest release useful and informative! 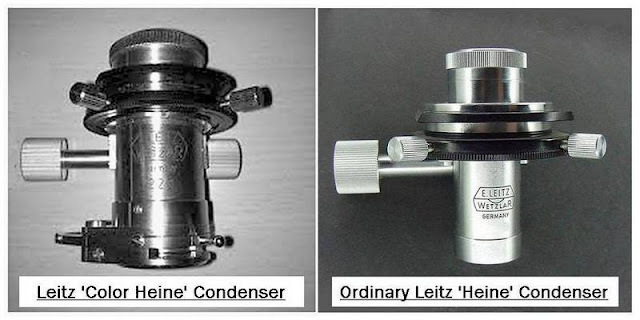 Part 1 covered technical details of the famous Leitz Heine condenser and its use. Part 2 extends this coverage to show how the Heine can easily be used with many non-Leitz scopes! The attached .pdf file contains Part 2 plus an updated Part 1 (with minor revisions). I hope you find this material interesting and useful! Here, finally, is the long-awaited release of current work on the Leitz Heine condenser. This Part discusses the basics of the condenser and its use. As usual, the file is in ".pdf" format and should be easily viewable online, as well as also downloadable and printable, if desired. The next release is planned to cover detailed Heine application information and discuss means for adapting the Leitz units to other, more modern scopes! I hope you find this useful. . .
Click on either of the above images for larger views. Click on any of the above images for larger views. For discussion of the Nikon IPC system itself, see the post of Feb. 25, 2017, in the Blog Archive. 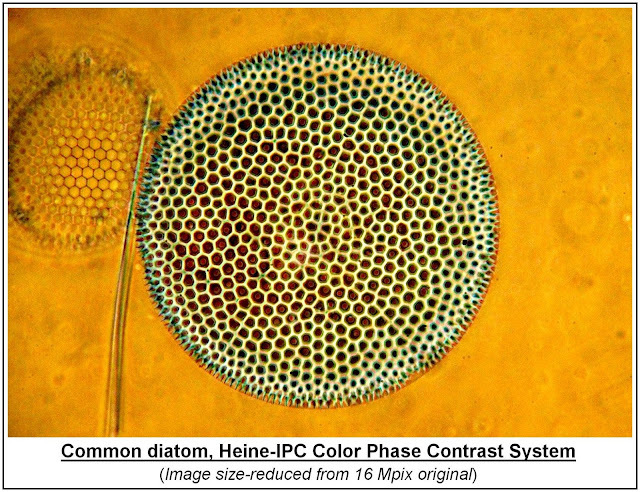 'Heine-IPC': A New COLOR Phase Contrast System? Supposedly, only 300 of these very specialized devices were ever made and only a very few are thought to survive today in working condition. Asking prices for working examples today are in the many thousands of dollars – one measure of their uniqueness, and scarcity. Few in microscopy have ever actually seen one, let alone actually used one, and even documentation is almost non-existant. Puplished photos taken through the unit are also extremely rare. Yet, one benefit of the Color Heine is the knowledge that it is technically possible to achieve Color Phase Contrast using an otherwise ordinary microscope, resulting an underlying desire to achieve this elusive end – somehow! 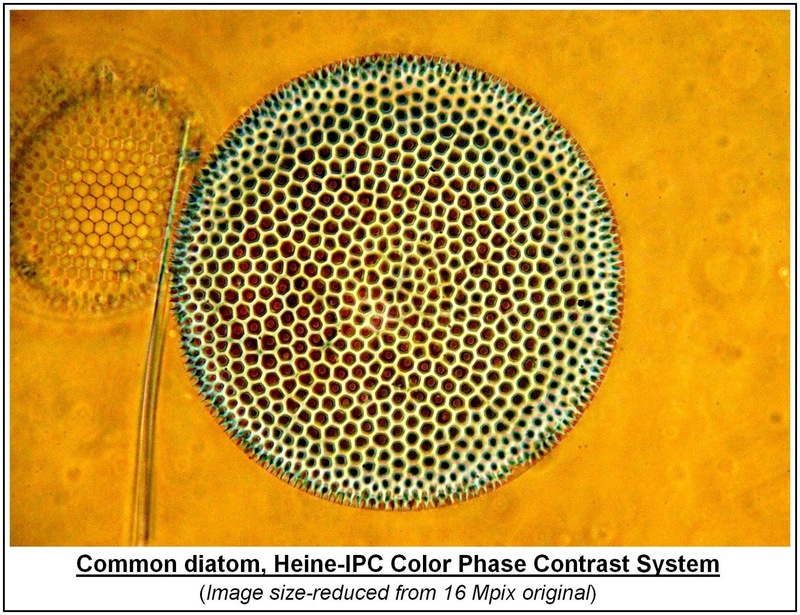 Now, the simultaneous availability of both an "ordinary" Leitz Heine phase contrast condenser, as well a working example of the not-quite-so-rare Nikon Interference Phase Contrast (IPC) unit, has resulted in an uncommon opportunity to experiment with the combination of these two disparate devices, in the hope of creating a practical and truly flexible 'Color Phase Contrast' System. The main limitation of the Nikon unit is the matter of finding a condenser with phase rings which acceptably match the phase plates inside the unit – in practice, something much easier said than done... In this light [sic] it was hoped that the Heine condenser could address this problem, resulting in a wider range of optics which could function usefully with the IPC. 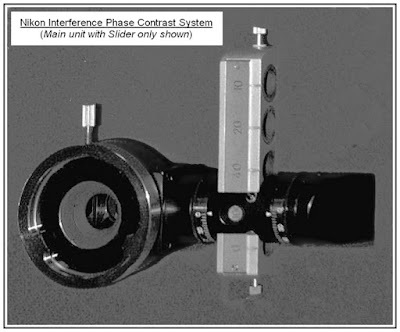 But, as the Heine was designed to fit only Leitz microscopes, and the Nikon IPC unit only Nikon microscopes, a certain amount of "Frankenscope" engineering is to be expected in "marrying" these two separate pieces in the hope of creating a new, viable (and practical) Color Phase Contrast system. The initial phases of this development effort are now nearing completion and the results should be posted here in the very near future. Note: Click on the above for larger images. As with any development effort of this sort, improvements in both image color and image quality are expected soon... .
3D Image Enhancement made Easy – Part IV. 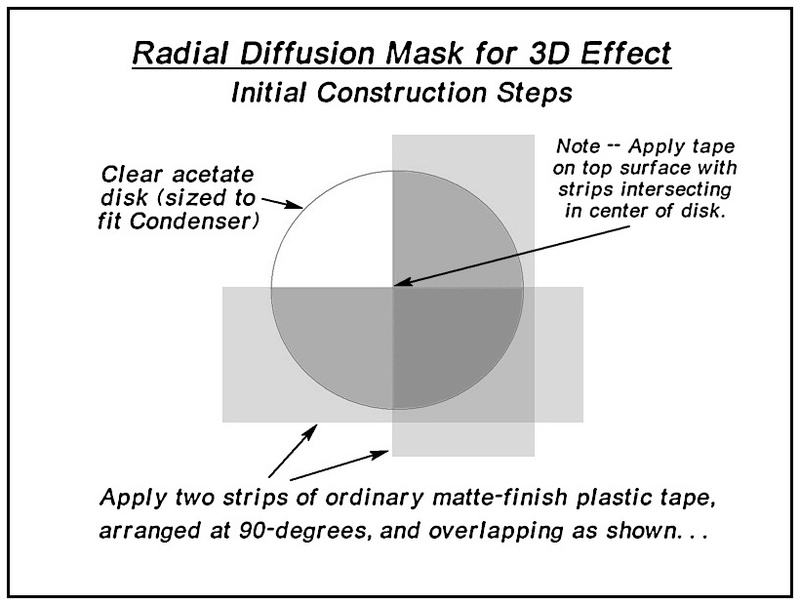 In prior posts we described a simple method, "Radial-3D Masking," for microscope image enhancement with could produce both contrast enhancement and a perception of "3D" (relief effect). However, while useful on its own, it is also possible to combine this method with at least one other popular contrast method, namely, "Circular Oblique Lighting", ("COL"). This new method has the potential to not only further improve contrast levels in the COL image, but also to add a 3D effect. Unfortunately, the results of this combination, in some instances, can become a bit excessive. 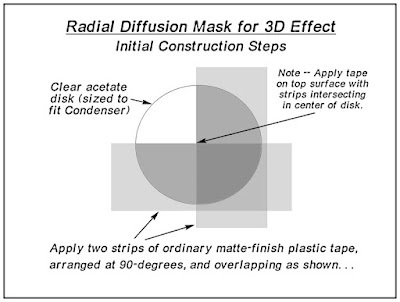 For this reason we will introduce a more moderate version of the Radial-3d Method, termed here the "Diffuse Half-Mask" ("DHM") method. Examples of just how simple and effective these "combo" contrast methods can be are depicted in the photo set immediately below. The image set on the left depicts increasing levels of "3D" effect, beginning with 'Brightfield' (no 3d enhancement), then 'DHM' (moderate 3D enhancement) and, finally, 'Radial-3D' (full 3D enhancement). The image set on the right depicts the same series, but now in combination with COL.
Click anywhere on the above image for larger versions. Note that when the image contrast is already high (e.g: Phase Contrast) additional contrast enhancement using these methods is likely to be rather limited, if at all. In any case, thoughtful experimentation is highly recommended! 3D Image Enhancement made EASY – Part III. 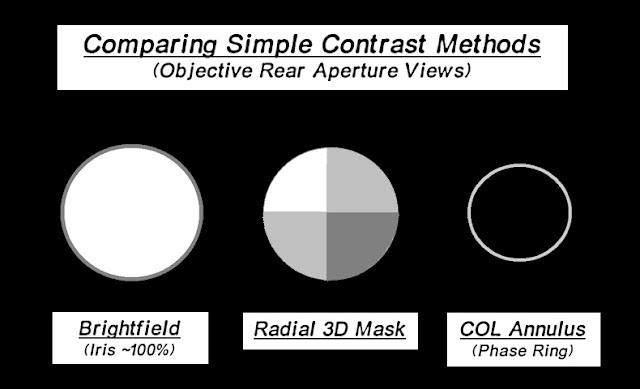 Comparing Simple Contrast Methods – cont'd. Part I (April 25th.) of this series introduced a new method of image enhancement (simple '3D') and gave examples of its use. Part II (May 3rd.) 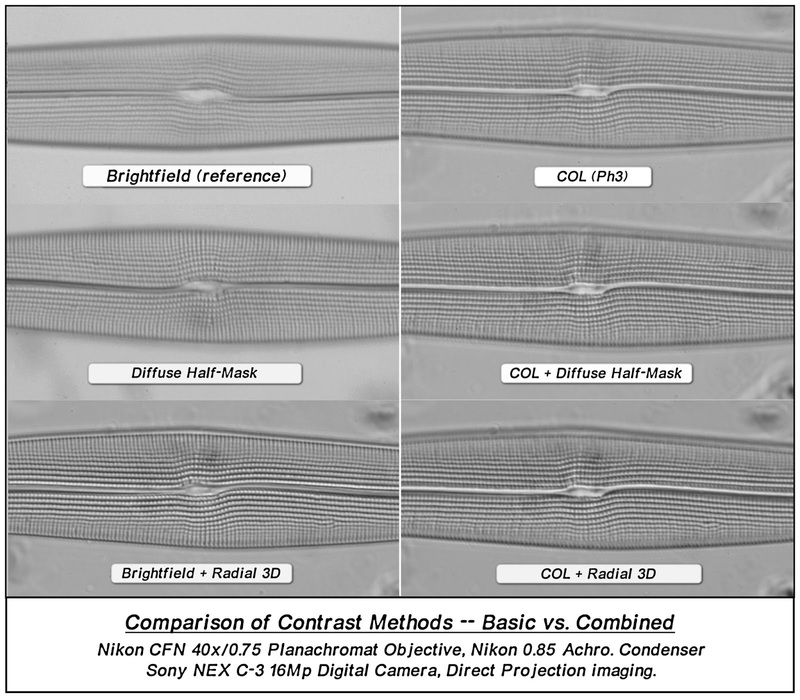 offered further examples of results using this method, particularly as compared to Brightfield and COL.
Part III continues this effort with examples at higher magnification and higher resolution. 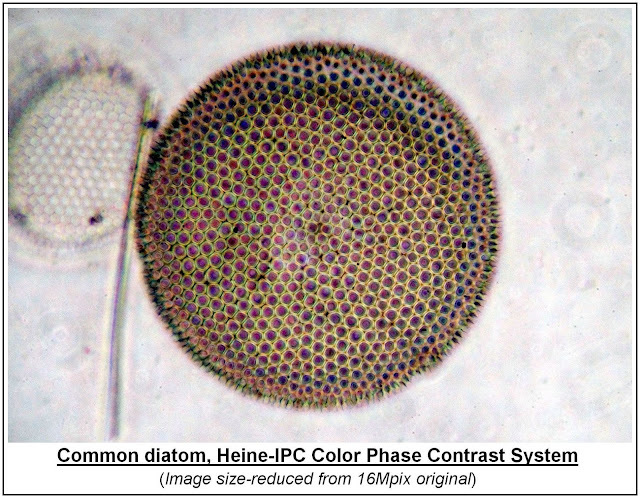 Note that the measured width of diatom used in these photo is approximately 21 microns, which results in a calculated 'dot spacing' of about 1.0 microns. As this is reasonably within the resolution capability of the NA 0.70 objective, the performance of the objective itself should not be a limiting factor in these tests. Not apparent in the photo set is the slight loss in overall image brightness associated with the 3D mask. However, this loss is a small penalty to pay for increased image contrast and resolution. Radial 3D versus 'COL' – more surprises? 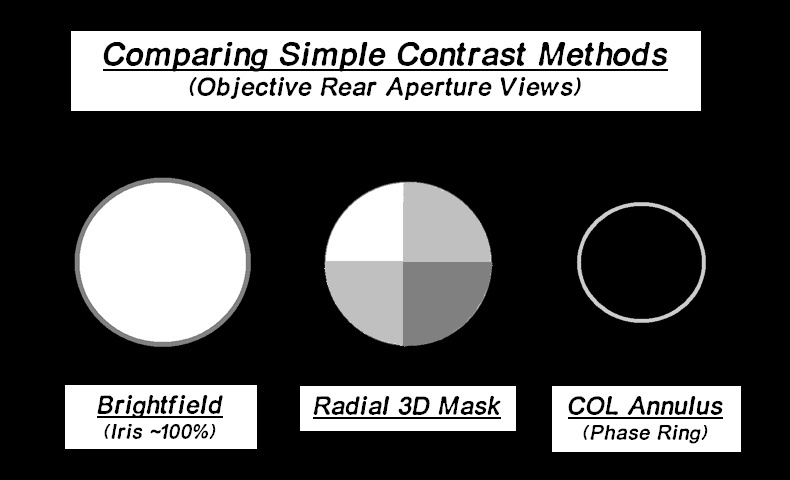 In the second set, below, we compare the Radial 3D mask method with COL, a currently popular alternative method of contrast enhancement. Once again, the relative levels of image brightness are not preserved in these images, but here, COL typically suffers a much greater loss of overall brightness (typ. 3 to 4 times greater) than does the 3D mask method. Here the 3D method appears to be at a disadvantage, at least initially, but only because the Condenser Iris was fully open (e.g: 100%). However, as shown in the third photo set (below), this limitation is easily overcome by simply reducing the Iris opening. This results in a sort of "variable contrast" mode, where the overall image contrast is readily controllable by means of the Condenser Iris. For Iris openings down to about 60%, there is very little loss in resolution, while even smaller openings (down to about 40-50%) may be used to achieve further increases in image contrast. Click anywhere on the above image set for larger versions. Note that the COL method has no equivalent mode! 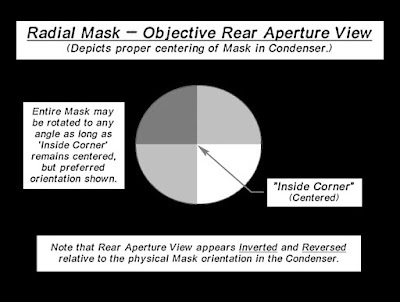 Finally, remember that, with COL, usually the entire condenser annulus (or the Heine condenser setup) must be changed with every change of objective, while, with the Radial 3D mask method, only a simple Iris "tweak" is all that is typically be needed, if at all. 3D Image Enhancement made EASY – Part II. A recent post (April 25, below) has revealed a very simple method of optical contrast enhancement, "Radial 3D Effect", which also adds a measure of 3D-like effect to an overall contrast improvement.. The method is very easy to implement and to use, functioning with a wide range of common objectives and yet requiring no special adjustments with objective changes. Yet, in spite of these these and other operational advantages (described below), the basic question remains, "Just how well does this new method work?" So, how do these methods actually compare? 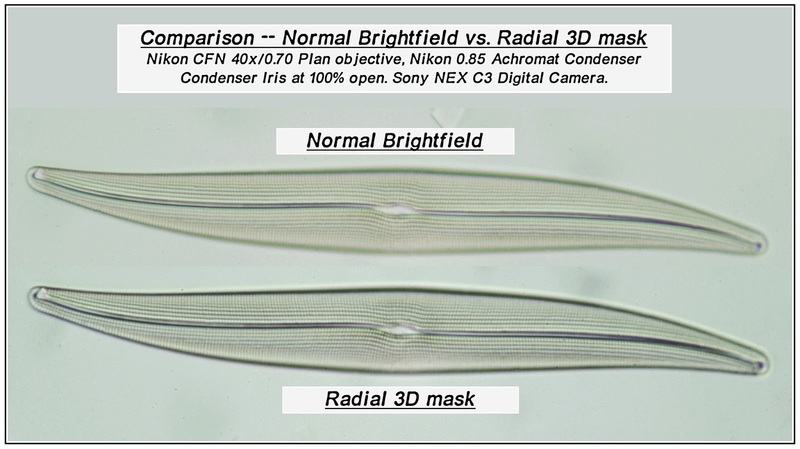 The top image is in Brightfield mode, with illumination by the Kohler Method, with the Condenser Iris set to about 100% of the full objective aperture. This is to serve as the "Reference" image. It reveals a reasonable amount of detail but one could hope for greater contrast. Also, the image appears "flat," revealing little of the object surface texture. 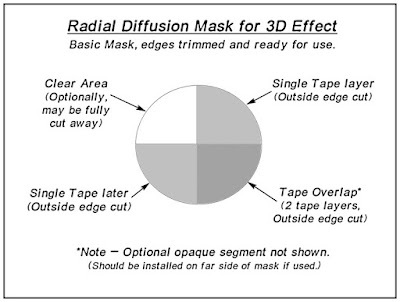 The middle image is basically identical, but with the addition of the Radial "3D" Effect mask discussed earlier. Note that this image shows not only increased object contrast and detail, but also reveals object surface contours, especially evident in the specimen on the left. One important factor, not shown by the above images, is the difference in overall image brightness which occurs with each of these methods. As expected, reducing the Condenser Iris opening in either Brightfield or 3D mode provides a slight increase in image contrast, but in the 3D mode this more significantly enhances the apparent depth-of-focus for the specimen. In general, Iris openings from 100 percent open, down to 50 or 60 percent open, can prove useful. At less than about 50% open, image resolution can begin to suffer noticeably. Unfortunately, the COL method (described above) does not directly support such control – with COL the only recourse is to switch to using a smaller diameter annulus, which often can have unpredictable and undesirable effects on the overall appearance of the specimen. Be aware that the image set presented above is not intended as definitive basis for comparing these methods, but merely as a basic indication of the results produced by each method. More precise imaging techniques for these three methods, as well as for some additional methods, will be needed to permit extending this evaluation to a more definitive level. Note that the above images are limited by minor variations in focus between modes, as well as a slight residual camera motion which may obscure finer detail. Both these issues will be addressed in the test setup before any additional comparison photos are produced. Recent posts covering the Goerz '3D' Condenser have sparked interest in creating an alternative approach suitable for use with ordinary (Abbe-type) condensers. The goals of this new effort were: (1) Low cost and Ease of construction, (2) Improvement in image contrast and apparent object depth, and (3) Ease of construction and use.. It is important to remember that the goals here are not maximum image contrast nor maximum resolution, but rather to simply achieve meaningful improvements in both (relative to normal Brightfield imaging) by use of the simplest and most generally applicable method possible. The method presented here appears to satisfy these goals and results in a simple addition which may be easily applied to an ordinary microscope condenser and, unlike other methods, (e.g: oblique illumination or phase contrast) may be used without any additional/special optics or concern for adjustments during use. Also, since the light loss is minimal, the device is suitable for use on instruments having limited illumination and/or at higher magnifications than these common alternatives. The device is constructed as a simple disk having an array of three diffusion segments, which modify the illumination in a predetermined manner and is essentially the same for all objectives, from 10x to 40x, or more. The "radial" approach both eliminates the need for adjustments when changing objectives and also allows the Condenser Iris to remain fully usable as an additional means of image control. Note: Click on any above image for a larger view. Most of the construction details for this mask are non-critical. 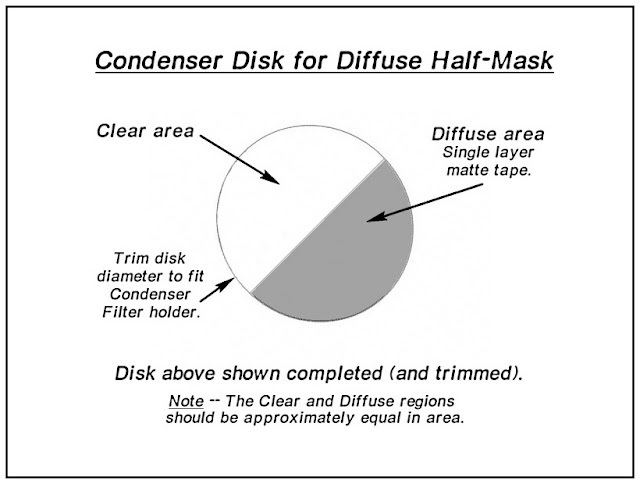 If the tape intersection point is reasonably close to the optical center of the Condenser when installed, then the device should function as intended. The precise angles are also not critical – anything approaching 90-degrees should work just fine. The specific type of "matte tape" to be used is also not critical. Ordinary, generic "dollar store" types seem to work about as well as anything else. As long as the tape width is about 3/4" then disks up to about 37.5mm diameter would seem feasible. Scotch (brand) Matte finish tape, however, apears to be superior to their "Satin finish" variety, which seems to exhibit less desirable diffusion characteristics, at least for this use. The acetate disk material is also non-critical. The basic requirements are that it be basically clear, self-supporting and thin enough to be trimmed with scissors. However, if your Condenser accepts a clear Daylight filter, then this might serve as an alternative substrate. 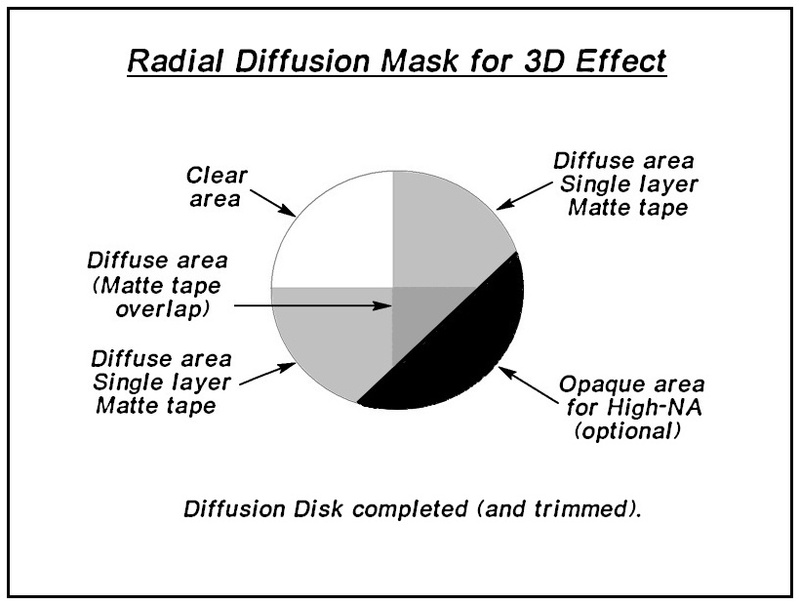 The Opaque segment may be created with a single strip of black PVC tape (plastic electrical tape), located on the reverse side of the disk, so it does not interfere with the matte segments. This allows the opaque segment to be re-positioned, if desired, without interfering with the other segments. For Condensers which have a significant bottom flange (e.g: most base-mount types), external mounting of the mask should be possible, as long as the width of the flange's bottom surface is sufficient to allow retention of the tape strips. 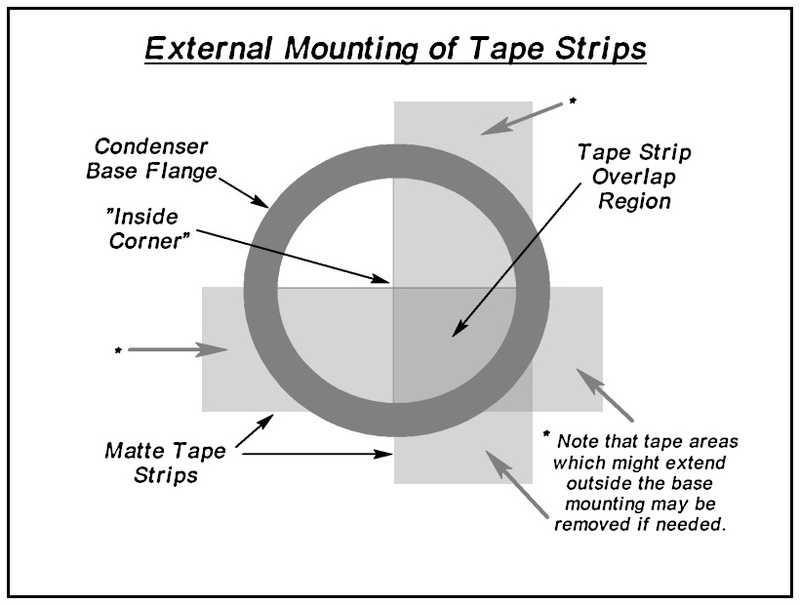 The tape strips are simply applied across the width of the flange, such that the "inside corner" formed where the strips overlap is located approximately in the center of the objective aperture, as viewed from the eyepiece position. (For the most accurate alignment, with the least difficulty, use of the 10x objective is suggested for this process.) 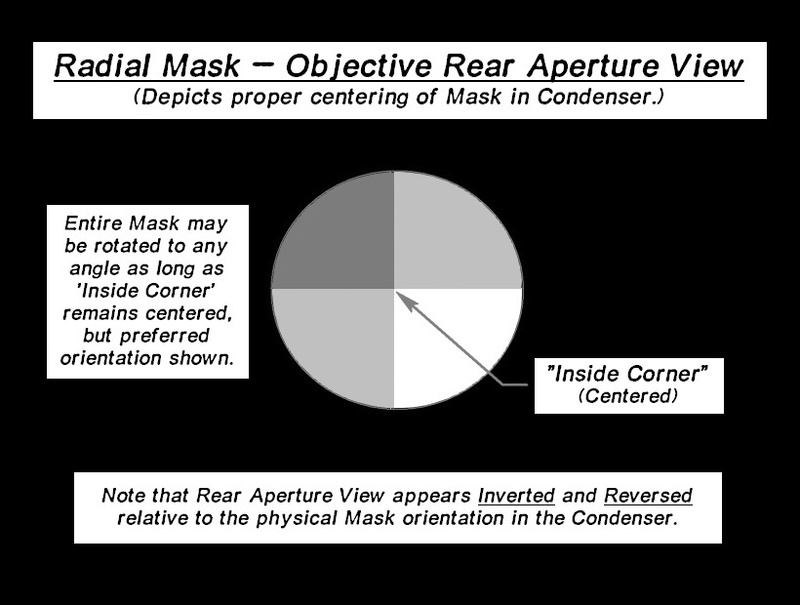 The two diagrams below depict both proper tape placement and proper overall mask alignment (centering). Be aware that the tape placement should be performed only after the Condenser has been properly centered in its mount, as for Brightfield use. 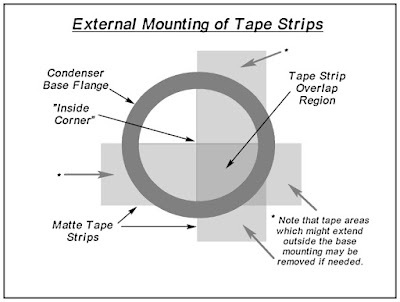 Once the Condenser itself is centered, any centering mechanism present should not be used to correct any misalignment of the tape strips. If the overall positioning is unacceptable, then the strips should simply be removed and re-positioned properly. Just remember that exact alignment is not essential for successful use!